General surgery - forum with Physicians ! 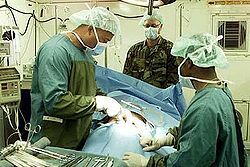 General surgery is a surgical specialty that focuses on abdominalcontents including esophagus, stomach, small bowel, colon, liver,pancreas, gallbladder and bile ducts, and often the thyroid gland (depending on local reference patterns). They also deal with diseases involving theskin, breast, soft tissue, and hernias.